As an innovative ERP provider, Xledger employs cutting-edge solutions for all aspects of its business. 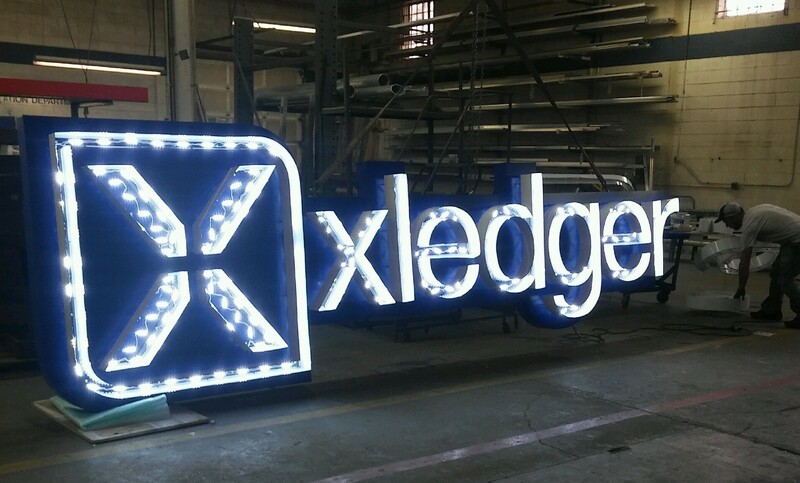 So when it needed a new sign at the top of its building, Xledger naturally turned to Spike, a daring system designed by ikeGPS. Partnering with Gordon Signs, Xledger used Spike’s laser-measurement system to record out-of-reach dimensions. The ultra-modern result now casts its LED glow over Xledger’s headquarters on 1311 Interquest Parkway. Spike is one of ikeGPS’ best products, an attachment to your smartphone or tablet that uses lasers to pinpoint and measure hard-to-reach areas. Once the laser points are designated, Spike supplies signage companies with immediate, accessible measurements. After I took my measurements, Spike also turned into a helpful sales tool. If a client wanted to see how a sign would look on the building, I could use the Spike length tool to measure the frontage. Based on what the county allows in relation to the size of the frontage and sign, I could show the client exactly how large the channel letters would look on the building with confidence that this particular size would be approved during the permitting process. This gave me a great chance to really engage the client and provide the client a visual before we even started the design process. Xledger delivers much the same advantage in the world of business management. The system’s developers toe the cutting-edge in on-demand analytics, with digitized invoices and a transaction history accessible at any stratum. Users view a dashboard tailored to their wishes and restricted by their position within the company. With over 7,500 clients in 50 countries, Xledger has proven its worth to corporations ranging from CURE International to KPMG. For more information on how Xledger can empower your organization’s decision-makers, visit our Solution or Technology pages.